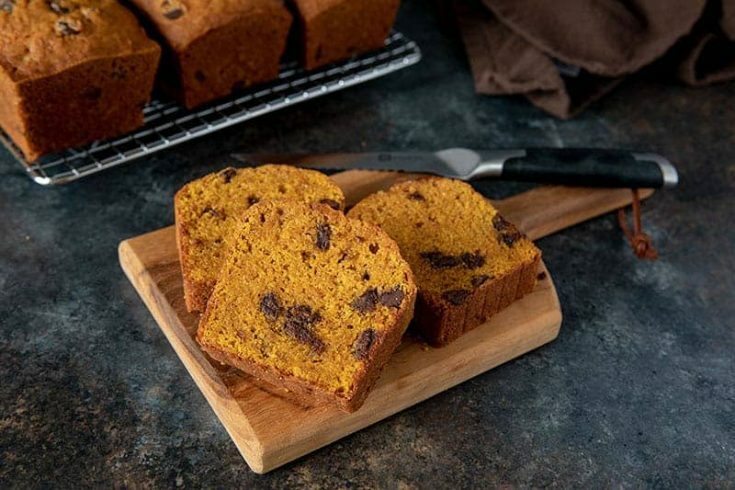 Pumpkin Chocolate Chip Bread is a popular quick bread for a reason. It’s easy-to-make, loaded with flavor, and has a pretty orange color—the perfect fall recipe. 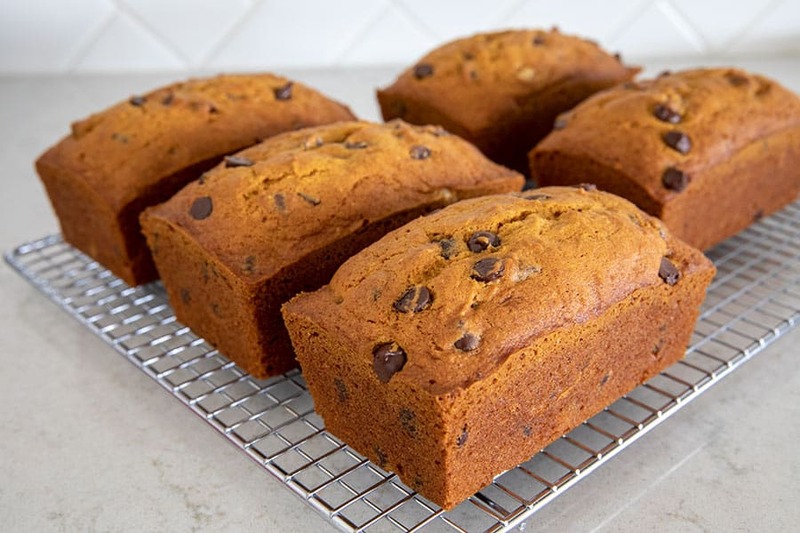 This Pumpkin Chocolate Chip Bread is my family’s favorite quick bread. It’s moist and tender and sweet and delicious. It makes a great after-school snack, and it’s sweet enough to serve for dessert. We even like to eat a slice or two for breakfast. I’ve tweaked the recipe until I got it just right. The batter is thick so the chocolate chips don’t settle to the bottom of the bread. You can make the bread in standard loaf pans, but I like to use mini pans. Then you can give one or two loaves away or put a couple loaves in the freezer for another day. I also like to portion out the batter using a scoop. The scoop shown above is a Vollrath Size 16 scoop. 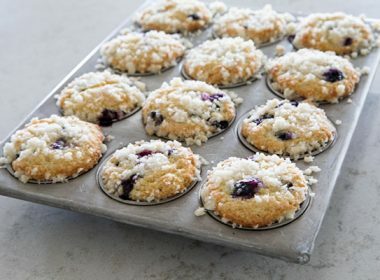 It’s the perfect size for muffins and cupcakes. Four scoops is just the right amount for the mini loaves. It’s best if you wait until the bread is completely cooled before slicing it, but if you can’t wait, be careful because the chocolate chips will be hot. 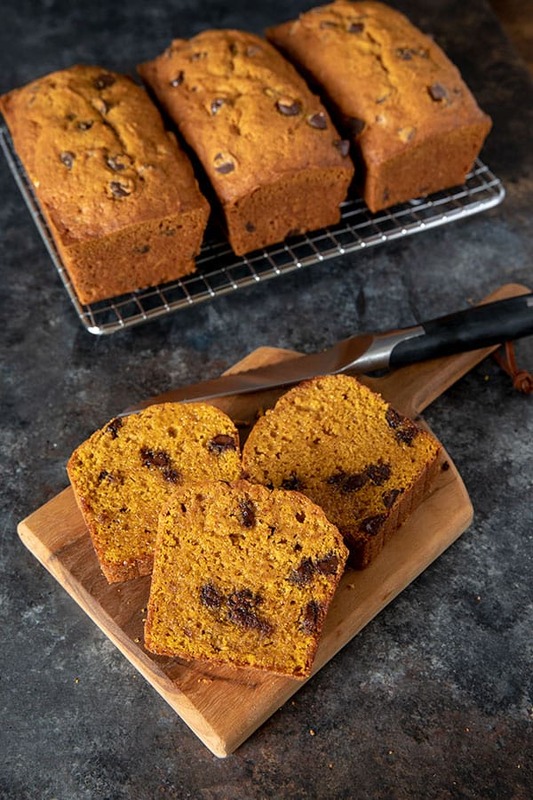 Like most quick breads, this Pumpkin Chocolate Chip Bread is even more moist and tender the next day. 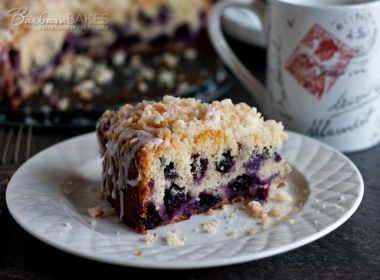 When I originally posted this recipe, I had made it and my Snickerdoodle Bread for the Food Bloggers Great American Bake Sale. 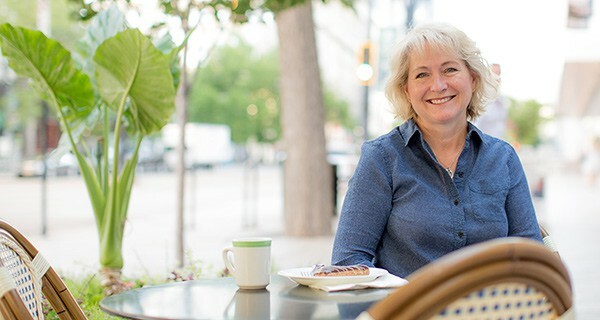 It was fun to meet up with some of my fun food blogging friends, taste some of their yummy baked goods, and raise money for Share Our Strength at the same time. Maria wrote a nice recap of the Bake Sale on Two Peas and Their Pod. Above is the original picture of my bread all dressed up and ready for the party Bake Sale. 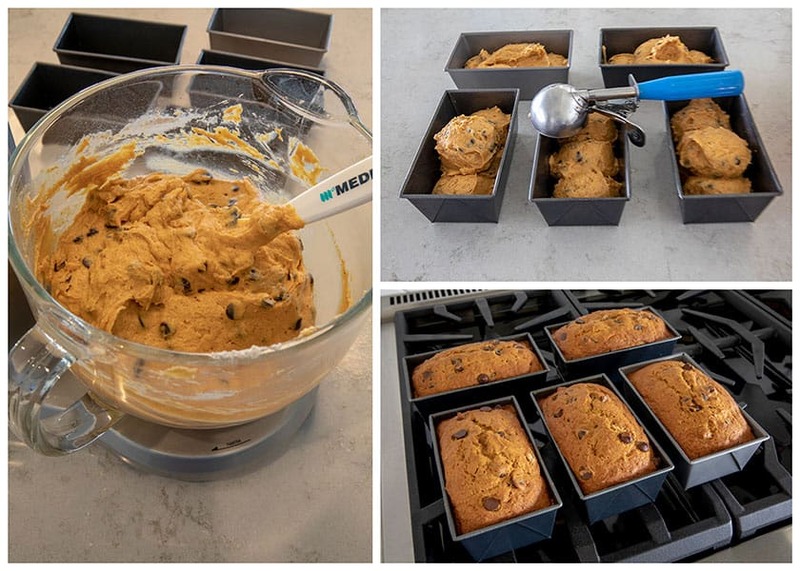 I hope you’ll give this Pumpkin Chocolate Chip quick bread a try—it’s perfect for fall! Let me know what you think. In the bowl of a stand mixer cream the butter and the sugar until fluffy, about two minutes. Add eggs one at a time mixing well after each addition. Add the pumpkin and combine well. Add the dry ingredients stirring until just combined. I want to make this. My pumpkin is 15 oz. do I need to compensate some how or is it ok? I hate they started reducing the sizes of products but left the same price. ;-). Hi Mary – no, your 15 ounce can should work fine. I just did an inventory of quick breads in my freezer and it appears they’re running low-perish the thought! This recipe couldn’t have come at a better time. 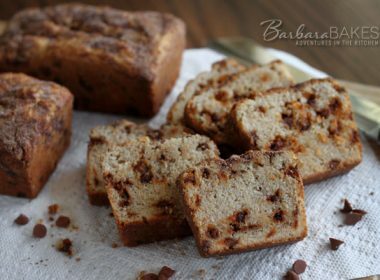 I love making mini loaves and I LOVE pumpkin and chocolate together-it’s such a perfect marriage of flavor. Mmmmmm……time to get baking! Is it possibly to convert this recipe into a “bread machine” recipe. No I don’t think so, bread machines are more for firmer yeast breads. This is a quick bread. If you don’t have a stand mixer, a hand held mixer will work, or I suppose you could whip it with a whisk if need be. Thank you so much for sharing! This sounds sooo good! I had to leave another comment telling you I made this bread and it was excellent. I actually just posted about it on my blog and linked back to your recipe. 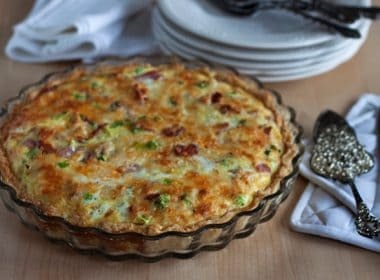 Thanks for a wonderful recipe that is now a family favorite. I've been craving pumpkin lately but I keep avoiding it. One look at your pumpkin bread and I think I just caved. I LOVE pumpkin bread! 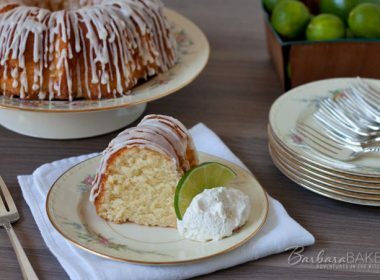 My daughter has a recipe that is fabulous, but I want to try yours now too! Pumpkin is my all time favorite and this looks nothing short of amazing. 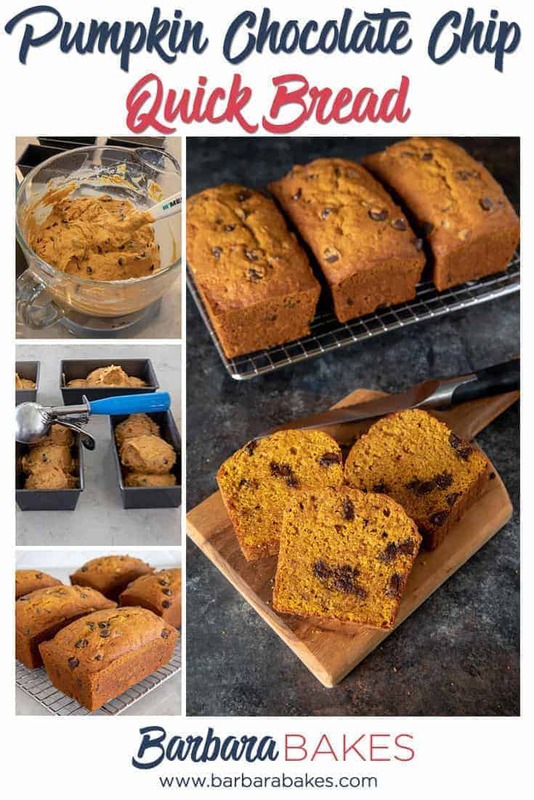 I lost my favorite pumpkin bread recipe and have been on the look out for a replacement and I think I might have just found it! Hope our having a great weekend. 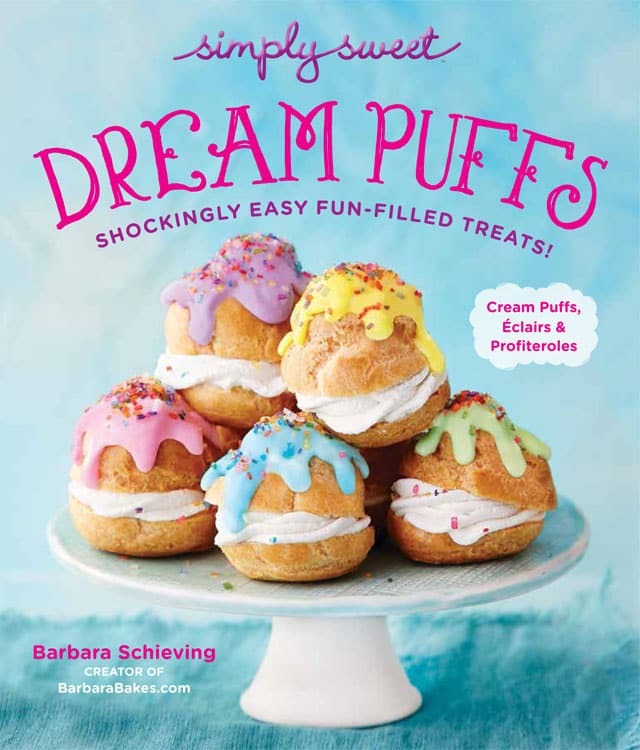 Barbara, so happy to have your recipes for all the breads you brought to the sale. I'm so glad I snagged the one I did because they were all gone when I came back two hours later! I will be baking with your recipes soon.